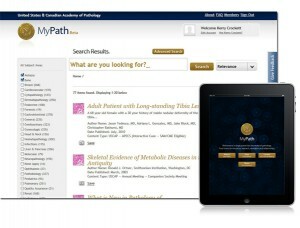 FOR IMMEDIATE RELEASE—May 14, 2012—ANN ARBOR, MI—Logic Solutions, the United States & Canadian Academy of Pathology (USCAP), and the Inovo Institute are excited to announce the development of MyPath: an innovative webtool and iPad app that connects the best content in pathology with the best experts in pathology. MyPath provides the pathology community with quick access to vital medical knowledge such as journal articles, textbook excerpts, slide images, lectures, USCAP meeting handouts, and other pathology-related content. With a single search, pathologists can swiftly mine through this compendium to explore the most salient, timely research available. MyPath is much more than a data portal: users may also save content, enabling them to build and refer to a customized collection of research. Additionally, MyPath’s social functions offer an unprecedented ability for pathologists to share and curate content. Comment sharing on MyPath content supports collaboration among members of the community, facilitating continuing education and engagement with research. Future functionality may offer the opportunity to view saved lists from other users, get updates on their changes, and more. MyPath is intended to be used by pathologists around the world. However, during the current introductory period, it is only available to USCAP members and non-members who attended the 2012 USCAP Annual Meeting in Vancouver. MyPath features a feedback component on every page that allows users to offer input on future enhancements. The United States & Canadian Academy of Pathology (USCAP/IAP) has been the global leader in the transmission of knowledge in the field of pathology for more than 100 years. The Academy has had a rich heritage of leading the provision of highest standards of pathology education for pathologists members like no other organization and attracts to its ranks the leaders in key areas of pathology. The Inovo Institute is a focused innovation consultancy that focuses on helping clients identify, understand, and communicate the sources and dynamics of future demand. Inovo works closely with clients across industries to help create compelling new solutions based on what is (and what will soon be) technologically possible.